I am making a hack called Castle Story. the Jest of the Hack is to show the events of Ballos that are told to you while running through the sacred grounds. you will play as Quote who is just built and is now serving a professer who built you. You will come to learn that the tyrant King has imprisoned Ballos and you must (unsucessfully) save him. to make some new music. here is a Video of what I have done. . . It's more or less going to be an alternate ending. similar to the ending where you fly off with Kazuma in the original game. A couple of tips when making a mod is never ask people to do stuff for you, people who have those skills are usually working on mods of their own and most people just don't want to help. You need to do it by yourself or just not at all. Also, a problem with the plot is that Quote was not built during the time Ballos was imprisoned and tortured, that happened years and years before Quote even existed. A couple of tips when making a mod is never ask people to do stuff for you, people who have those skills are usually working on mods of their own and most people just don't want to help. You need to do it by yourself or just not at all. Although with the way it was worded in the OP it sounded like you're relying on help from outside forces for a few different areas. It's the difference between saying "I could use a little help, I've tried it myself already" and "I NEED help please god somebody help me"
But yeah if you're planning on making a prequel mod you should probably take a closer look at the storyline/backstory of the game and also probably look through the "theories" section of the forums. E: After watching your video, I noticed that you have quite the number of punctuation errors in your script. Not spelling issues or anything, but it still is pretty obvious. I have no problem with it either, I was just warning him because of how others on the forum don't like it when people ask for help. Castle Story, huh? I enjoyed your video, and I look forward to seeing how you make this into telling the story of Ballos. But like the others have said, Quote's creator probably wasn't even born until Ballos had already been sealed in his chamber for many years, so I'm not sure if and how you're going to adjust your mod to fill in this major plot hole. 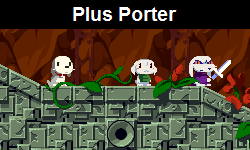 I'm also curious as to how the fact that Quote, Curly, Balrog, and Misery are all together back on the island in peace lines up with the events of Cave Story. Anyway, like MagicDoors said, there were some punctuation errors in your dialogue, but more than anything what I noticed was a lot of capitalization errors that really could use some double-checking. Well sorry yeah that was mostly what I meant, I guess I should have been more specific. I always pictured quote and curly as recent technology and thought that the events spoken of in sacred grounds where set in a more medieval or early renaissance time period. Although it could be in a much different time period, it sounded like Ballos was imprisoned in the island thousands of years before the events of cave story. Anyways, this is an interesting concept and I would be glad to see where it goes. It looks really good so far! Keep up the good work! Without belaboring what some of the other users have said re: the time line of events in relation to the main Cave Story plot (although, I suppose your mod doesn't necessarily have to line up with the cannon—I mean, you are having Quote speak, which already departs from tradition if not from cannon), there are just a couple of things upon which I'd like to remark. Your writing for the characters really seems pretty good. The dialogue flows nicely so far. While some of the other folks have commented about capitalization and grammar, I'd like to specifically point out your use of "your" when you mean "you're." Remember, if you could replace the word with "you are," then you want to use "you're." If you can't replace the word with "you are," chances are you want to use "your." The one with the apostrophe is a contraction for the two words and shows a state of being, while the "your" shows ownership. Another thing to consider is that if this had happened before the events of the canonical Cave Story, I would think that Curly's reaction to having her memory restored after eating the Ma Pignon would be drastically different from what we saw in the original game. Something along the lines of, "OMG WTF are you doing?! You put on the crown once and now you're going after it again?! NOOOOO! This did not end well last time... !" Also, if Quote once wore the crown, shouldn't he have had a statue in the statue chamber before you go fight Ballos? All this to say that I'm intrigued by what you're doing, and I look forward to seeing how it progresses from here on! Good stuff, man! I'm not quite sure what you're going on about. You almost appear to be suggesting that the scene of Quote putting on the Demon Crown was an actual real life memory coming back to Curly. I interpreted it as a nightmare, rather. Also, I think it's fine that Quote's lines are shown on screen in that nightmare scene since it's from Curly's perspective. The time when I feel it shouldn't be shown is when the scene is being shown from Quote's perspective. And when Curly is awake, we don't see any more of Quote's lines, probably indicating that it's shifted to Quote's perspective, so I think it's fine the way it is in that regard. I have errors in my spelling, have quote speaking, and stuff that doesn't match up with cannon. and have a odd ending to the cutscene. . .
That's because I wanted to have the "Get the Demon crown" as an option similar to the "Heroes end" where you fly off with Kazuma in the original game. as for the spelling. . . I was more worried about getting all the animation correct, it took me two hours to get it right. like quote losing the "Crown" and curly leaving correctly, it's my first attempt at Animation. by the way. it was never mentioned when Quote was built. . . it could have been during the time of Ballos. he did make the people thrive after all. Oh, derp. You're right, Hayden. Thanks for setting me straight! I find your post to be a bit incoherent... But I'll try my best to interpret it. Sort of a bad ending type thing if you take the crown? But that looked more like a nightmare. Or does the mod end on the note shown in the video if you say yes to taking the crown, and the mod last longer if you say no? Probably not, but that's the only thing I'm managing to get out of that sentence. So that scene of Quote putting on the Demon Crown was a nightmare? by the way. it was never mentioned when Quote was built. . . I suppose you're right, but I think it is very strongly implied by the game that Quote probably wasn't made "Ages upon ages" before the events of Cave Story. Electricity probably hadn't been even discovered yet. I suppose it isn't explicitly stated, but it is strongly implied. umm, you replied so fast that you didn't give me time to edit my post. . . The only two things added in your edit were "it could have been during the time of Ballos. he did make the people thrive after all. ", and telling us that you appreciate all the help. Personally, I don't think the fact that Ballos helped people of the kingdom thrive is a very firm basis for Quote having been around when Ballos was imprisoned and driven mad. The fact that this took place in a Kingdom governed by a King probably indicates that these events didn't transpire any later than 1500 AD, a year looked upon by many as the end of medieval times. I also believe that since no such technology exists to date that even comes close to robots as advanced as Quote and Curly, Cave Story takes place at least a hundred years into the future. 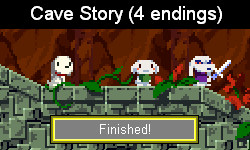 So the possible gap between Ballos going mad and the events of Cave Story is six hundred years at absolute minimum. Sure, Ballos' guidance and assistance given to people of the kingdom earned their love and trust, but do you honestly think that in the short amount of time between then and when the king grew jealous and imprisoned him (I'm guessing a few years at maximum, but for all we know it could have only been a few months), Ballos could have instigated the necessary innovation to discover electricity and advance technology in a few years far beyond what has been achieved over the past 236 years? I, personally, find it very odd that you think Quote was around when Ballos helped the people of the lost kingdom, and I'm not seeing any solid evidence to support such a theory. well, Are you saying that I should give up the idea then? because I would like to make this game after all. after all. . .
is it wrong to "bend" a few rules? to make a non-cannon game? Does the game take place in the real world? I doubt it, especially with creatures like Monster X and mimingas. is it bad to mix Technology and Medieval themes? If you want to make the mod canonical you could incorporate time travel. This is, however, just a suggestion and you can make it however you want. It is your mod after all. No, I'm just saying that you're going to have to adjust your mod if you don't want a serious contradiction to the main story line. You do bring up a good point there. Quite a lot of modders do it, some of them in full awareness, and I myself even have plans on making a mod which flouts Pixel's official statement that Misery dies in the normal ending, so I guess if you really think the setting of Quote being around during this time sets the stage for a good mod, then I'll stop bothering you about it. No, it doesn't, but that doesn't mean that there is a low likelihood that our historic timeline is similar to that of the Cave Story universe. I must say I've never seen it done before, except in cartoons and novels where people in our time period or later use a time machine to travel to the past. I've seen stuff like this done before, not specifically with Medieval themes but, I have seen games and other forms of media merge fantasy and sci-fi together; an example would be Terraria which contains many fantasy themes but also includes Ray Guns, Robots and other technologically advanced items used in conjunction with fantasy items.